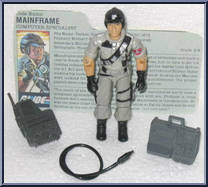 Mainframe enlisted in the Army Airborne at the age of seventeen and made it over to South-East Asia for the last year of hostilities, just in time to get his Combat Infantryman's Badge. He left the Army to get his degree from MIT on the G. I. Bill and did a stint toiling in the antiseptic corridors of Silicon Valley making big bucks and fighting off boredom with a stick. Luckily, the Marines were looking for a few good men with just his qualifications. The proper papers were signed, and Mainframe was back in uniform. "Too much of the modern battlefield is computer coordinated not to have a computer specialist right out there in the field with you. Problem is, most hackers don't exactly fit the combat profile. Mainframe is the exception. He was ten years older than the next oldest trainee at Parris Island and he still finished at the top ten of the class. He's got brains-but he's hard." Contribute pictures, update details or suggest corrections for Mainframe. Write a review about Mainframe.